Apr 19, 2017 – Herbert E[dwards] (Herb) Field, the Sage of Springs, passed to his eternal reward yesterday at 92 years old, according to his pastor, Rev. Nancy Howarth. A memorial service for Herb Field will be held at 10 a.m. on Saturday, May 20 at the Springs Community Presbyterian Church, at the intersection of Old Stone Highway and Springs Fireplace Road. 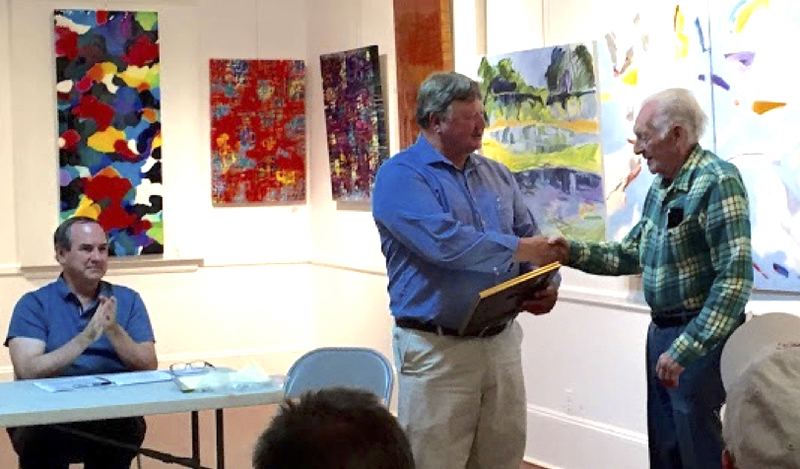 Last year, he received a well-earned temporal award at an end-of-summer meeting of the Springs Community Advisory Council in Ashawagh Hall. East Hampton Town Councilman Fred Overton presented him with a Proclamation testifying to his contributions to the Springs community. 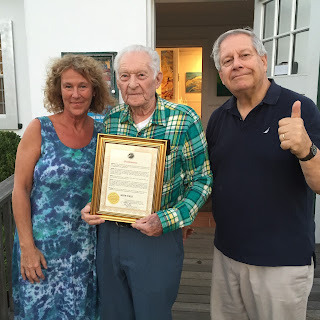 Overton's presentation was on behalf of East Hampton Town by its Supervisor, Larry Cantwell. At the presentation, the crowd attending the meeting gave Herb a standing ovation for his contributions to his country and his community. 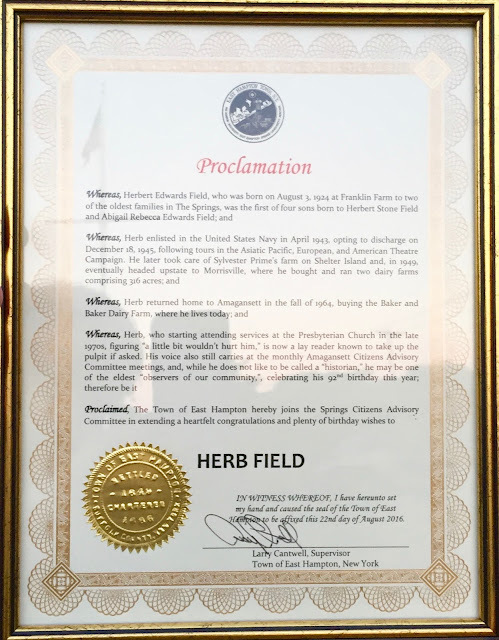 The citation, signed August 22, 2016 by Supervisor Cantwell, proclaimed that Herbert Edwards (Herb) Field was born at Franklin Farm on August 3, 1924 to Herbert Stone Field and his wife Abigail Rebecca, née Edwards. Herb was the eldest of four sons. After the death of his father and uncles, he worked for Ferris Talmage to help support his mother and brothers. Talmage remained a lifetime mentor. Herb enlisted at 17 in the U.S. Navy in April 1943. He served as a motor mechanic on board destroyer escorts. He was sent on tours in the Pacific, Europe and the Americas. He was honorably discharged on December 18, 1945. After his military service he managed Sylvester Prime’s farm on Shelter Island and then in 1949 moved to Morrisville, N.Y., where he purchased and managed two dairy farms covering 316 acres. After 15 years upstate, he purchased the Baker and Baker dairy farm in Amagansett and lived there until his death. Herb faithfully attended the Springs Community Presbyterian Church starting in the 1970s and sat consistently in the second row behind the organ donated by Robert Mulford. For what must have been four decades he arrived an hour before the service every Sunday morning and started the coffee pot brewing, until one day not so long ago he announced he couldn't keep doing this any more. When I first came to Springs in 1981 as a seasonal visitor, I started singing in the Springs Church choir and was invited, faute de mieux, to join "The Men of Springs," a church-related activity. My wife Alice Tepper Marlin was dubious about this. It sounded macho. Who knew what sinister plans these local deer-hunters, who probably looked askance at seasonal families "from away", might not be up to? Then we found out that the principal public activity of the Men of Springs was to cook and serve a community chicken dinner with no apparent female support. Her attitude to the group mellowed. So I was a seasonal participant in the program, but over time the number of men who composed the Men of Springs dwindled, lost to illness or death or retirement to a place where they could get assisted living — or unassisted living — at an affordable price. In time, the remaining men could not keep up the tradition of the annual chicken dinner. The event was continued, like so much else, through the devotion of the hard-working women of the church. Herb was, I think, the last of the Men of Springs who were there when I arrived in Springs 36 years ago. 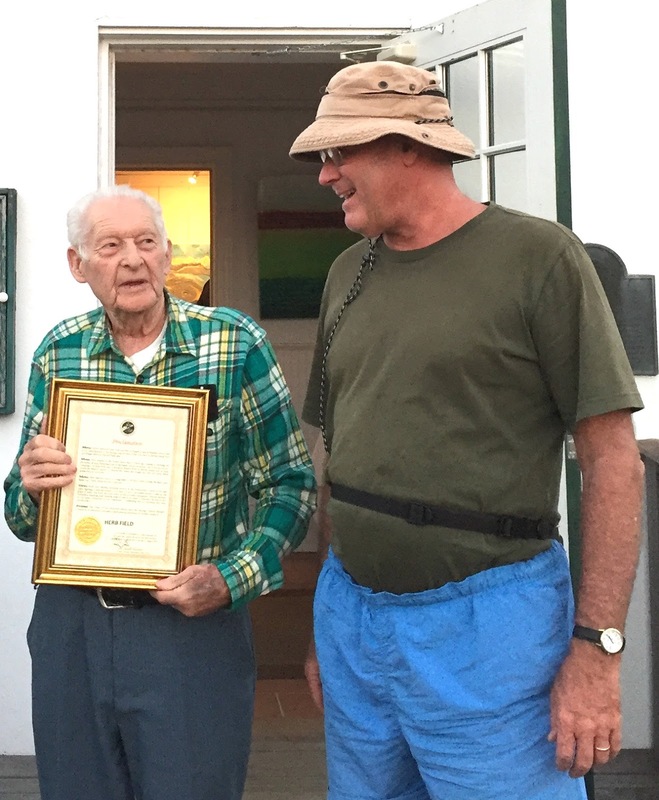 Herb earned the title of Sage of Springs because he knew more about the history of Springs than anyone else alive. He commented as an aside that he remembered when Supervisor Cantwell was "in short pants." Over the years Herb told me more truly funny stories than I can count. He had a keen understanding of farming, canning, clamming, milling and human nature and he communicated it with his dry Bonacker humor, of which he was acutely aware and proud. For example, during the period of my Men of Springs membership, I was in the kitchen, and everyone there was highly aware that I was a city guy out of my element in the Springs culture, which for centuries was built on faith, farm, fish and family. I came in for a lot of teasing as the country bumpkins enjoyed showing the city slicker how little he knew about what was important. At one point they explained to me that how nutritious the food was, and that the delicious ginger gravy they were serving with the chicken had no sugar or flour in it. I was amazed. How could they do that? They swore on the bible they added no sugar or flour. But I saw a glint in Herb's eye, and I demanded that he tell me, based on my rights as a fully vested seasonal member of the Men of Springs, what the ingredients were. He said: "Well now, we have the juice left over from the chicken and we filter out any skin and the heavy fat. We cook it all in a pan and stir in some green onions and celery, and some garlic, about 4 minutes..."
"We add some pepper, thyme and sage..."
"And... what else?" I demanded, getting a little impatient. I learned over time to look for the signal that Herb was about to deliver the punch line to his story, which he loved doing. He would become super-serious. "Then, well now, you know, for every quart of gravy," he said, "we mix in five ginger-snap cookies." After God created Herb, He threw away the mold. The following is reposted with permission from Resist and Replace, a blog started by David Posnett. 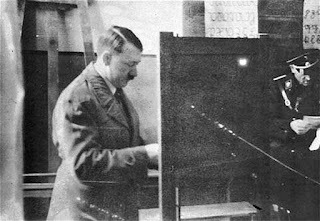 It is completely legal in NY State to choose where you wish to vote as long as you don’t vote twice (in different locations), which is voter fraud. 1. A court case upholding voting rights for part-time residents in Southampton. 2. A useful website explaining your rights. 3. How to register on-line. 4. How to download the registration form online and then send in by mail— particularly useful if you want to help someone fill out the form. Get some forms and have them handy. Bring them to events and share them with your friends. 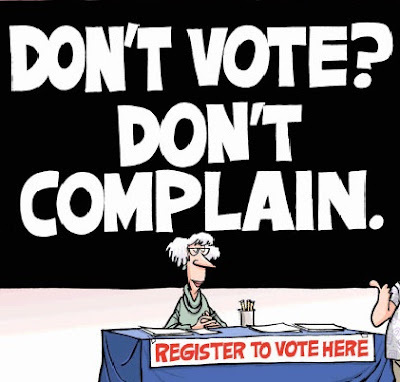 For example, hand out registration forms at your July 4 barbecue! It is a good idea to start now. in return for bank and securities regulation. 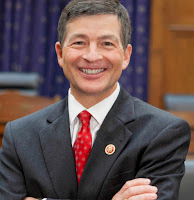 Jeb Hensarling (R, TX-5), Chair of the House Financial Services Committee, has announced a beefed-up Financial Choice Act to eliminate some key Dodd-Frank provisions. It would reduce Sarbanes-Oxley and JOBS Act regulations. The bill, Hensarling 2.0 (H2O), proposes major structural changes to the Consumer Financial Protection Board (CFPB) and the SEC. Hensarling has said he would get H2O through his Committee to the House floor by the end of April. • repealing restrictions on the kind of subprime mortgages that caused the 2008 financial crisis. Hensarling believes that his Financial Choice approach should replace Dodd-Frank entirely. But if Dodd-Frank reforms were passed in present form, they would undermine the 2010 financial regulation law. The skeleton will still exist, and the new bill would act as a disable-and-disregard "remedy" to Dodd-Frank. 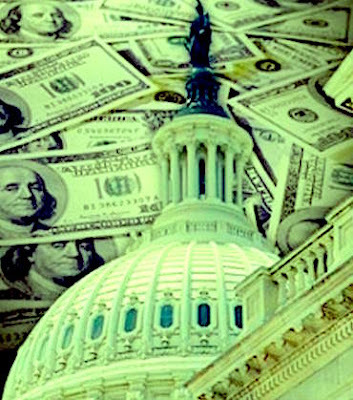 With that in mind, the bill will most probably not make it to the floor until the summertime, per Rep. Patrick McHenry, vice chair of House Financial Services. Although passing the Senate would require a Herculean legislative effort to create a bipartisan measure, some Republicans are still looking for ways to roll back Dodd-Frank while avoiding working with Democrats. GOP Senator Pat Toomey suggested last week that the reconciliation process to repeal regulations on a simple majority vote basis is still available. What is interesting is the Republican interest in capital regimes, which monetize regulations. Another way of looking at these is effectively as a corporate tax. So instead of ducking a regulation by imposing a corporate tax, the GOP could weigh that out during their tax reform efforts as a means to compromise with Democrats. Hensarling’s new plan also includes reducing the frequency of bank stress tests performed by the Federal Reserve (once every two years as opposed to annually). The plan would also give the president the authority to fire the directors of the CFPB and restrict its oversight, as well as changing the code of conduct between the SEC and private companies. With some banks backing key portions of the 2010 law, such as the need to preserve the Financial Stability Oversight Council and the Orderly Liquidation Authority from Titles I and II, the bill's road to the President's desk will not be an easy one. If it passes the House, the Senate will almost certainly reject it. Related Posts: Economic Hotspots . Banking (Glass-Steagall) Act of 1933 . 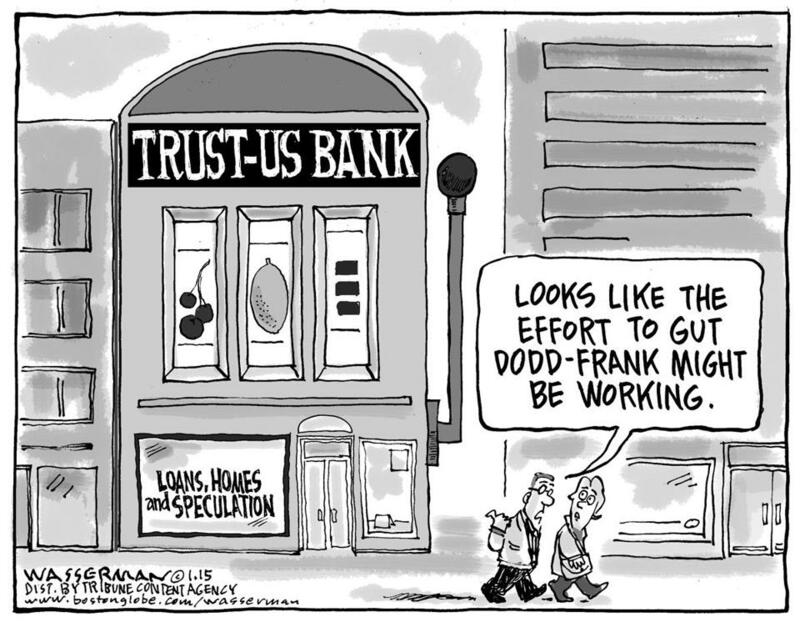 Dodd-Frank Act . Clinton and in 2009-2016 with Obama. Sources: BLS, FRED (St Louis Fed). March 7, 2017—The BLS reported this morning on the March jobs data. Total nonfarm payroll employment rose by only 98,000 in March, following gains averaging 217,500 in January-February 2017. Services to buildings and dwellings (+17,000) and architectural and engineering services (+7,000) did well. Most of the gain in mining occurred in support activities (+9,000). Mining employment has risen by 35,000 since a recent low in October 2016. However, retail trade lost jobs (-30,000). Competition from the Internet is likely hurting bricks-and-mortar retailers. Employment in general merchandise stores declined by 35,000 in March and has declined by 89,000 since a recent high in October 2016. 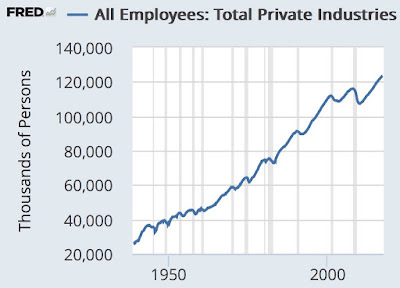 The good news is that with higher levels of technology the jobs that remain are better paid. Health care continues to create jobs, as it has for decades, added 14,000 in March, with gains in hospitals (+9,000) and outpatient care centers (+6,000). In the first 3 months of this year, health care added an average of 20,000 jobs per month, compared with an average monthly gain of 32,000 in 2016. Financial activities, the best-paying jobs, continued to trend up in March (+9,000) and jobs in the sector have increased by 178,000 over the past 12 months. Construction employment changed little in March (+6,000), following a gain of 59,000 in February. It has been trending up since late last summer, largely among specialty trade contractors and in residential building. Neil Irwin in The New York Times today (p. B2) says that "it was a mistake" for Trump to point out the strong growth in jobs in February, because he drew attention to a number that in March didn't work out so well for the new administration. What? Trump promises more jobs, and he shouldn't focus on the monthly job numbers? I have been working with the job numbers for a long time, and I don't think Irwin is correct in advising the President to shift attention away from them, certainly not at this early stage. Trump's biggest campaign commitment was to "Jobs, Jobs, Jobs". 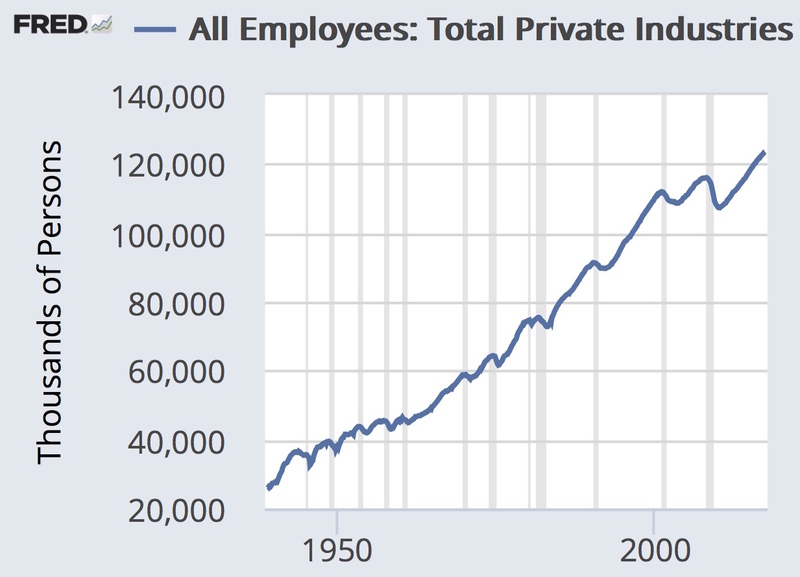 The number he has to beat is payroll jobs as shown in the chart below. Sure, these numbers are revised periodically, but they are the coin of the realm. BLS collects job numbers from each state based on unemployment insurance filings within each state. If a monthly number is out of line, it gets looked at more carefully. These numbers are well grounded. Yes, the employment/population number is a good way of comparing long-term job-creating performance, because it eliminates issues involved in unemployment questions asked of the survey respondents in each sampled household. ("Who is not working? Have they been recently looking for work?") It is more resistant to survey-question creep. But the denominator, population, is not a reliable number for month-to-month comparisons. No, probably, to Irwin's proposal to pick age groups within the employment/population ratio. It would require tagging each unemployment insurance report with a year of birth and dividing the monthly job change according to age groups. Maybe this could be done—or the numbers could be estimated based on a sample—but will the new information be worth the effort? Might be something for a state government with a strong Unemployment Insurance staff to experiment with. Job Growth by Month since the post-Glass-Steagall Meltdown of 2008. The U.S. Economy at Risk as Washington Debates. My friend Dana Chasin sent me a summary of economic issues before the Congress at the end of the first quarter of 2017. With his permission, I have re-posted it below. The issues add up to some strong challenges that will not be easy for the GOP to address. Having struck out on replacing Obamacare, Trump is facing the likelihood that the First 100 Days may go by without a single significant piece of legislation. One of the subtlest but surprising developments of the year to date is the sense that Wall Street itself (the financial industry) is not as warm to the idea of repealing the law as Trump is. Several major firms and the Wall Street Journal -- yes, even its masthead editorial page -- have signaled caution when it comes to the president’s actions on Dodd Frank. More and more investors believe that the administration is unlikely to deliver any significant jolt to the economy. Given that the vast majority of rules and regulations from the Dodd-Frank Act have already been implemented, the best that the SEC can do is amend them or grant exemptions on a case by case basis. If legal objections were motioned as a result of the SEC’s actions, it would slow down the already drawn-out process. It seems that the already difficult tax overhaul process just got a lot more complicated for Trump. The GOP in Congress are having trouble agreeing on a bill that Democrats won’t filibuster. This all started when two senior economic officials who served in the Obama administration, David Kamin and Brad Tester, published an article that found that the much talked about Border Adjustment Tax will not produce the kind of revenue the President has suggested. If their report is confirmed by, say, the CBO, then it would throw the whole tax agenda off because they would not be able to produce a bill that wouldn’t add to the debt. The Trump administration is working hard to ensure a legislative success before the year is up. There are a lot of opportunities and a lot of road blocks (think Blue Dog Democrats and the Freedom Caucus). Recently, the President’s legislative director met with moderate House Democrats to propose working with them on the tax reform plan. One of the Democratic lawmakers who attended the meeting said that the legislative director declared the border adjustment tax dead on arrival. If that is the case, then Donald Trump’s protectionist campaign promises will be broken, a prospective trillion dollars in revenue will be lost, and tax reform, lacking a pay-for, will limp forward, or not. There have been rumors this week that the White House is considering a carbon tax and a value added tax to make up for the loss of revenue that will be induced by the massive tax cuts Republicans are aiming for, both on the income and corporate side. If the carbon tax is in the bill, the Freedom Caucus had have reason to vote against it. The White House has flip-flopped on the VAT and carbon tax, saying that it was considering them at first and soon after disavowed them completely. Given the collective lack of experience this administration has, their negotiation efforts are very transparent and their tactics are easy to dodge so far. This flip-flop shows that the Freedom Caucus should have reason to be cautious of their trust in the House leadership to put forth a plan with their inputs taken into account. This is precisely why the plan is showing signs of ripping apart at the seams. This and the BAT may get debated extensively over the next few months. Don't be deceived: they are dead letters in Congress. For some reason, the administration decided to pick tax reform as its next big ticket item after the health care debacle, opting for the more difficult and partisan route. The president may once have had a shot at working with Democrats who have been asking for infrastructure investment for a long time, but it seems that Trump is ditching that train for now. The president’s infrastructure plan might, accordingly, also be too ambitions. With a goal of a trillion dollars, Trump aims to pass large tax subsidies to investors willing to pour money into infrastructure investment. There are many reasons this plan is risky, one of which is that large firms will be getting nothing short of massive government handouts for investments they are probably going to make anyway. Last year, Congressman Delaney came up with a plan that could give the president a pass around Democratic obstruction. His proposed infrastructure bill combines infrastructure investments, which Democrats have been eying for quite some time, and international tax reform, an issue that Republicans have been keen to tackle. And here’s the catch: it has strong bipartisan support with 40 Democrat and 40 Republican cosponsors. By going with tax reform first and seeking more money than Obama's stimulus package, this administration’s legislative agenda and self imposed August deadline suggests remarkable legislative incompetence. Despite being able to check off submitting a statutorily required budget to Congress from his to-do list, Trump can hardly consider this any sort of accomplishment at this point. As it was not even dead on arrival -- Congress will not consider or even hold hearings on it -- and grossly increased the deficit, there is nothing to see here as an accomplishment. The biggest obstacle to a sweeping tax reform is the Democrats in the Senate, who could easily filibuster a bill if it adds to the national debt. The reason for that is that tax legislation that adds to the debt cannot be passed by a simple majority vote as per the reconciliation process that passed the budget resolution earlier this year. That said, there are still ways around the filibuster with a model similar to the Bush Tax Cuts which passed in 2001. The budget resolution passed earlier this year through a reconciliation process could give the GOP some leverage in the legislature. While it may miss on major reforms, the administration could push through several smaller tax reforms that could pave the way for the president’s infrastructure plan. If Trump were serious about infrastructure, Republicans could look to Congressman Delaney’s plan and set a less ambitious goal than $1 trillion. In regard to repealing Dodd-Frank, Republicans are having a much harder time than they had anticipated. As noted, the intricate law has recently picked up an unlikely supporter base: Wall Street itself. The industries main newspaper has cautioned against repealing the law, and several key players have joined the Dodd-Frank chorus. That won’t stop Republicans, however, from at least seeking to chip away at some parts of the law. This is just the beginning of what is going to be a drawn out process, with several wins and many losses. The question is can the president pull a rabbit out of a hat and pass tax reform or will this administration be legislatively stillborn come August recess? Money can buy many things and every administration has a learning curve but it is already beginning run out of the one thing it keeps trying to buy: time. Related Posts: Banking (Glass-Steagall) Act of 1933 . 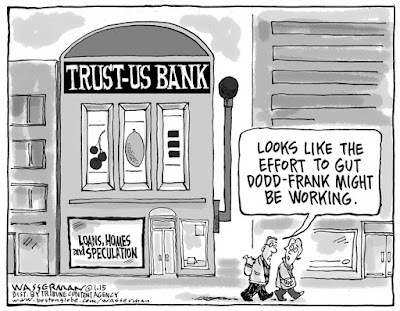 Dodd-Frank Act . The clicker has passed 340,000 views on this blog, about two million on all of them combined. Here are the top ten most-viewed posts in the last month. Nos. 1, 5, 7, 8, 9 and 10 all relate to the Great Depression, FDR, Hitler and the Holocaust. 3 BLS | "Phony Numbers" on Their Way?